ï¿½The longtail boat drops you at reception at the pier in front of the resort and instantly you know you have found a very special part of the worldï¿½. The views from the resort are world class looking out onto to Phi Phi Ley island, the cliffs at Tonsai and crystal clear and gleaming sea on a sandy beach. The resort faces the warm water and cool breeze of the Andaman Sea. This creates a relaxed and secluded atmosphere. The Resort is a series of low density bungalow cottages on the side of a gently sloping hill over looking the reception, pool and beach. The wooden balcony rooms are on stilts among the tree canopy. The interior design is by far the best seen on Long Beach and rooms boast all the soaps and towels needed for comfort. The atmosphere is young and trendy 25-50 year old, the style is rustic beach tropical with comfort. This resort is one of the best and most popular in the Tonsai Village - Long Beach areas. 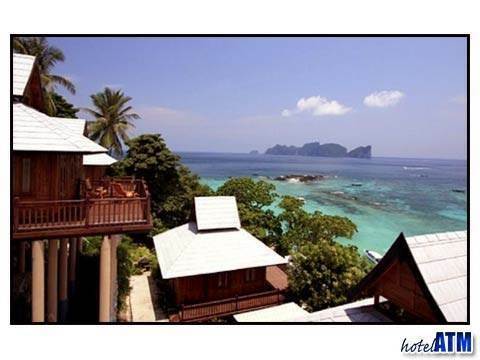 The Phi Phi The Beach Resort features in our Top 10 hand-picked hotels for 4 categories, including Best Mid Range Hotels in Phi Phi, Best Bungalows on Phi Phi Island, Best Beach Front Resorts on Phi Phi, Best 3 Star hotels on Phi Phi Island. 5/5 The Beach Resort is the Best! !